Matt Murdock standing over a group of fallen enemies. 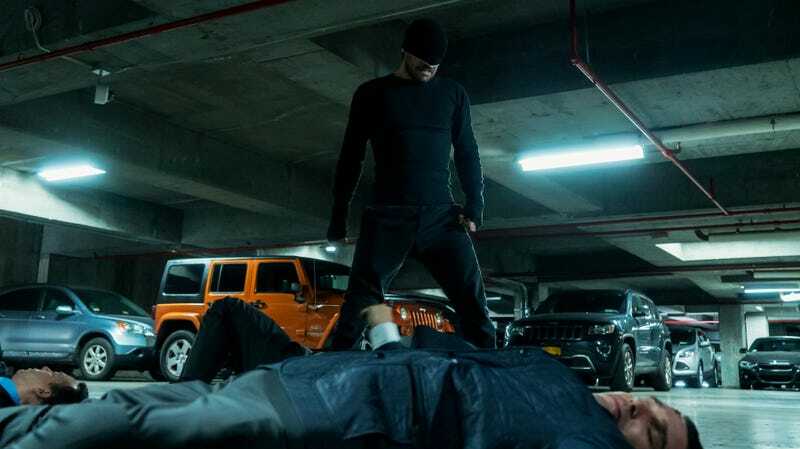 Every Netflix series set in Marvel’s Cinematic Universe introduces a handful of new villains for their heroes to duke it out with and the latest Daredevil trailer proves that the show’s third season isn’t going to be an exception. Matt Murdock will face off against Wilson Fisk, but the Kingpin won’t be alone. There was ever any doubt that Fisk would eventually make his way out of prison and set his sights on the Devil of Hell’s Kitchen for revenge, but the new trailer makes clear that as dirty as the villain is willing to get his hands, his plan to take Daredevil down will be...elegant, in a word. If Daredevil’s a hero for the people, Fisk reasons that the best way to destroy him is to turn New York City against him and the quickest way to do that is to frame him. The thing about being a vigilante running around in a mask while you break multiple laws in the name of justice is that, well, pretty much anyone can put on a mask and suit that looks like yours and straight up claim to be you. Fisk, obviously, isn’t going to make a go of cosplaying as Daredevil, but he has someone in mind whose unique skills make them perfectly suited for the job. They’ve got the reflexes to hurl Matt’s Baton. They’ve got killer fighting skills. And way back in Daredevil’s first season, there were already signs of his arrival. Is Matt’s new copycat foe potentially our first look at one of his most infamous comics foes, Bullseye? The trailer doesn’t make it explicit—but if that’s Bullseye wearing a copy of Matt’s suit and masquerading as Daredevil at Fisk’s behest, then there’s a solid chance that when Daredevil’s third season drops on October 19, it’ll have at least a little of the Dark Avengers arc—in which Bullseye, disguised as Hawkeye, joined another bunch of disguised heroes in Norman Osborn’s own take on the Avengers—woven into its narrative DNA. Update: Netflix has made it official: Bullseye is coming to Daredevil’s third season. New casting releases from the company have confirmed that Wilson Bethel will play “Benjamin Poindexter,” one of several official names that deadly mercenary best known as Bullseye has adopted over his years as a professional hitman. He’s well known for making Matt’s life... well, even more miserable than it usually is in the comics, so expect big things from his arrival.